Sorry for only getting this post up now but it has been very hard to concentrate because Zach and I got engaged! I am so happy! I will refrain from writing the typical cheesy lines every engaged girl says but, I do feel all of those things. I am so looking forward to this exciting year- now, back to the food! 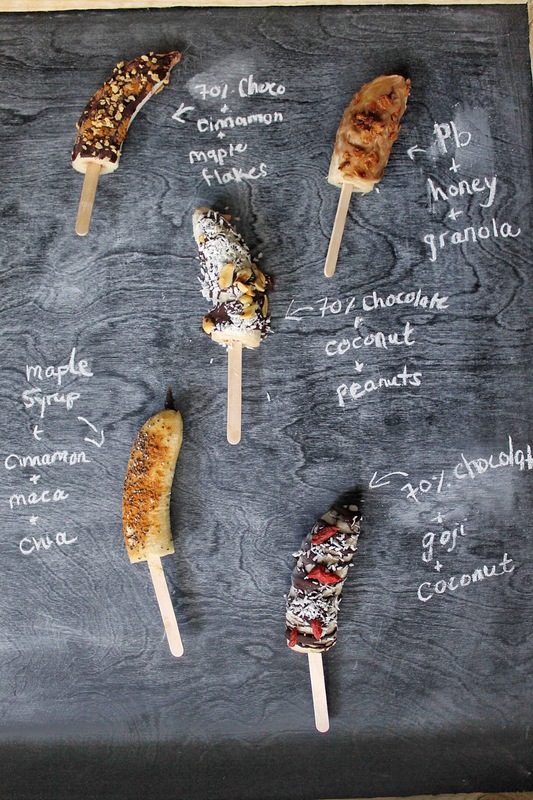 So, I’ve seen a lot of banana pops all over the internet that are mostly just dipped in chocolate and then decorated with sprinkles-boooooorinnggggg. 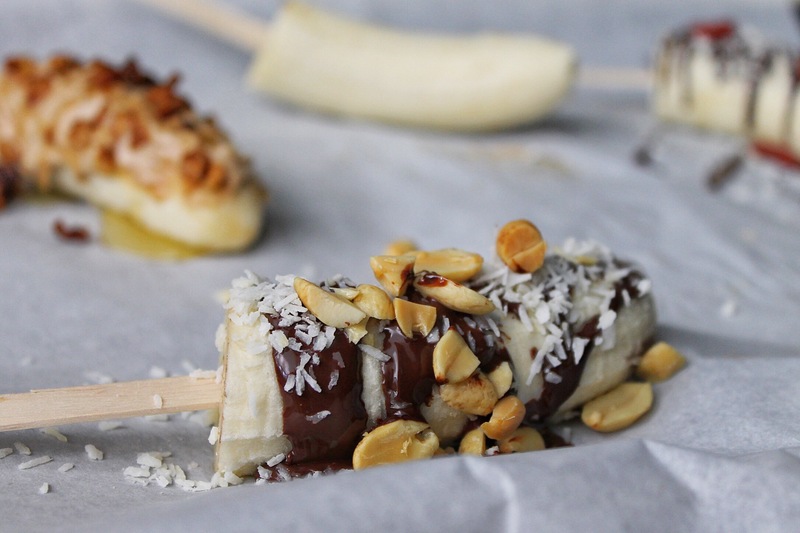 When you think about all the amazing combinations that go well with bananas, the possibilities for this healthy summer treat are endless. Although chocolate makes a great sticky base for a variety of toppings, pure maple syrup and peanut butter do the trick as well. You can mix and match these toppings to your liking or even add your own! The possibilities are truly endless and most importantly, delicious! This is also an amazing activity to do with your kids or at a party. So easy to do, and made in minutes. It’s never been so easy to get your nutrients in a tasty, naturally sweet dessert. I know you’re going to love this one! a perfect way to get your superfoods! Simply drizzle melted chocolate and sprinkle toppings. 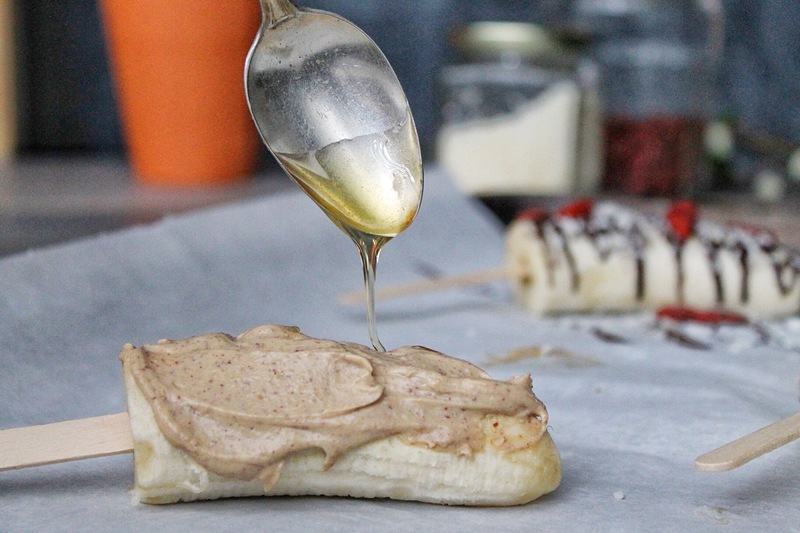 drizzle maple syrup over the banana and spread with a back of a spoon. The sprinkle with toppings. Loosen stiff peanut butter by whisking with hot water until it becomes more liquid. 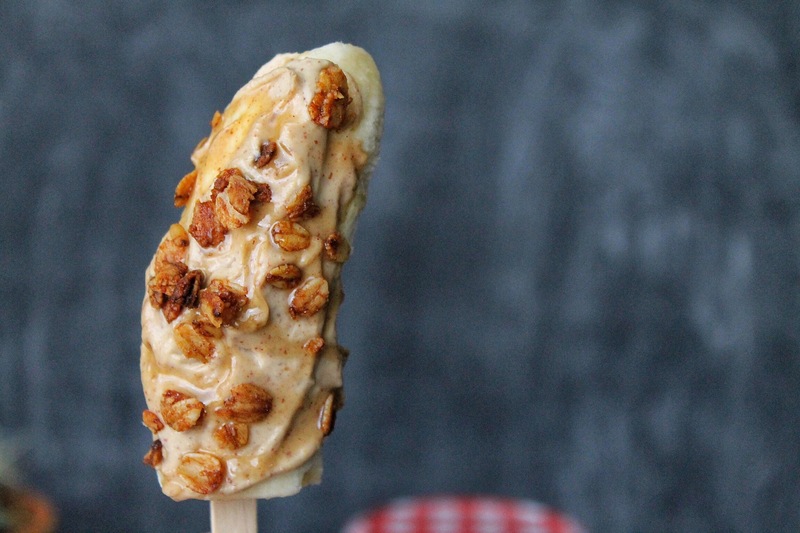 Spread over banana and drizzle with honey and granola. 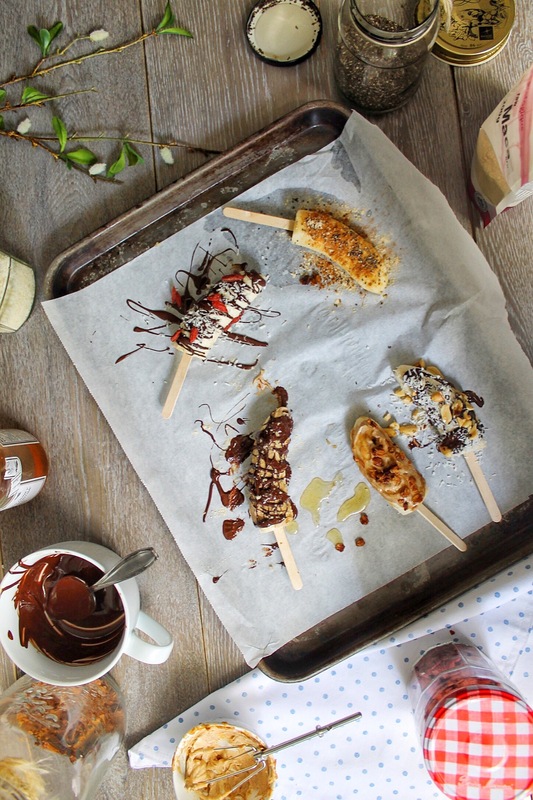 Drizzle or dip in melted chocolate and sprinkle with cinnamon and maple flakes. 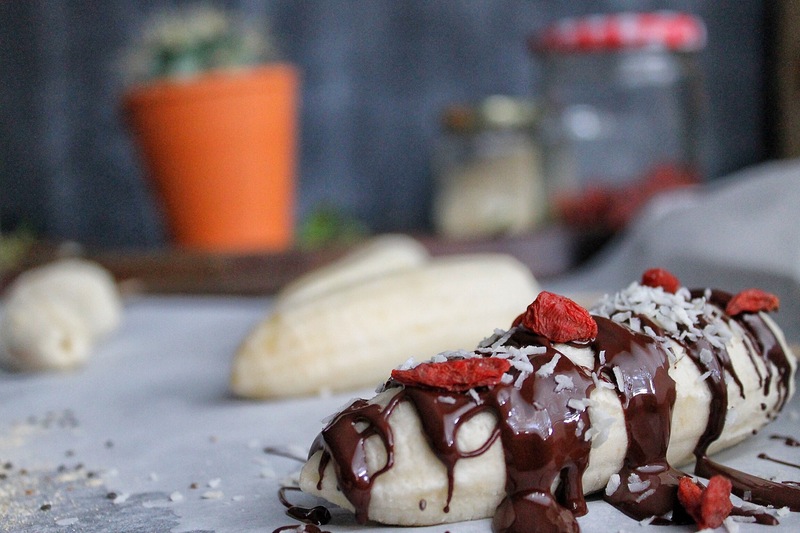 Coat with peanut butter that has been whisked with hot water (to make it spreadable), drizzle with melted chocolate and sprinkle with maca. Coat in melted dark chocolate, sprinkle coconut, chopped peanuts and a pinch of sea salt. • toppings of choice: peanut butter, dark chocolate, unsweetened coconut flakes, peanuts, honey, granola, goji berries, cinnamon, maca, chia, maples flakes etc..
1. Cover a large baking sheet with parchment paper. 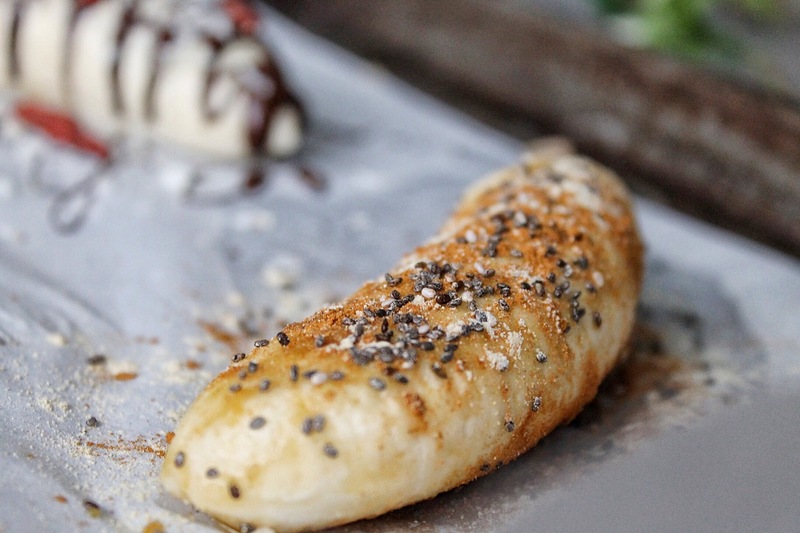 Slice bananas in half then peel. Place on baking sheet. 2. 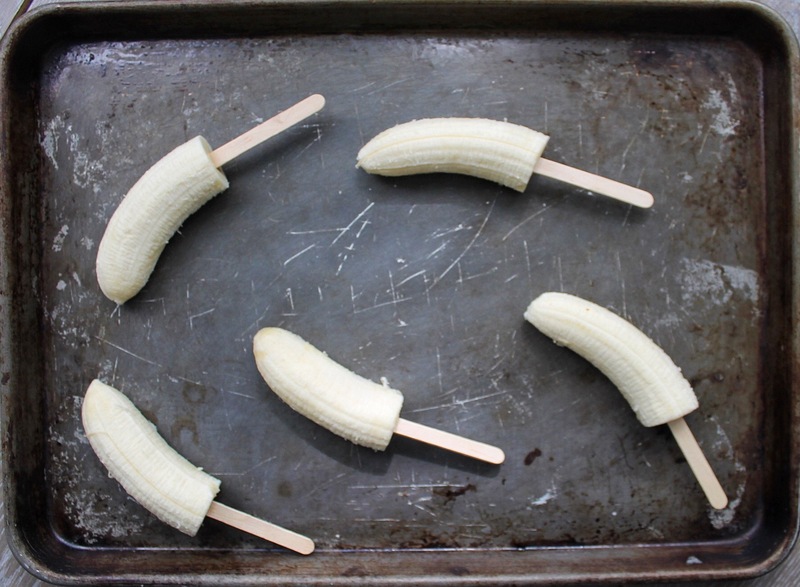 Insert popsicle stick half way through each banana. 3. Prep toppings and decorate! 4. Place in freezer for at least 3-4 hours.